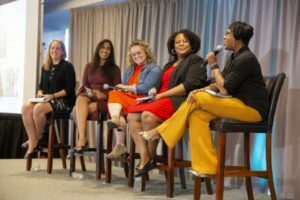 The underlying theme of the session, and a message driven home in the 2017 Unrealized Impact report, is that having a team that looks diverse doesn’t mean we’ve created a space where everyone experiences a sense of deep belonging and connectedness so that they can do their best work for kids, families, and communities. Likewise, solving for representative demographics does not automatically translate to equitable internal systems, structures, and behaviors. In fact, based on the data, we are not seeing equity in organizations until both diversity and inclusion are in place. And this was true for each of the presenters, too, regardless of where they were in their journeys. Many of the panelists talked about a “turning point” or “defining moment” that brought this work to the forefront for their organization. 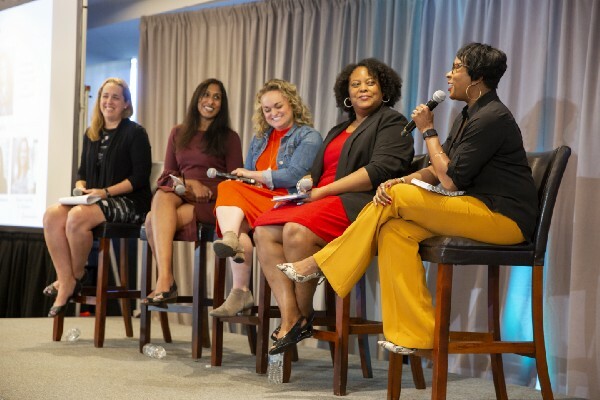 For Dr. Tonya Horton, Vice President with TNTP, it was an outside event: when Hurricane Maria hit Puerto Rico, TNTP’s response plan included a meeting between the organization’s CEO and the Latinx Affinity Group. After soliciting input, the organization’s CEO committed to returning to the affinity group before making a final decision. However, this final step was missed. In the interest of efficiency, leadership made their decision without consulting the group again. After a facilitated workshop on white dominant culture at a TNTP leadership retreat, a member of the affinity group spoke up, and it became clear this instance was symptomatic of larger, ongoing issues. Responding in real time, the leadership team decided to scrap that day’s agenda to make room for dialogue. Following that retreat, and a public acknowledgement and apology from the CEO, the TNTP staff team has continued to lean into the uncomfortable conversations that were previously avoided, and have started talking about and working to actively decenter dominance in the TNTP culture. Many of the panelists emphasized the importance of taking action. Athena Palmer, Executive Director of Teach for America – Memphis, said she hasn’t found talking to be helpful. She has found discussions around DEI to consistently center whiteness at the cost of non-white people in the room. Athena has been working hard to move past talking to concrete changes in actions and behaviors. For her, this means constantly assessing her organization against their DEI goals, changing the definition of who was able to work on her staff by reversing priorities and focusing on cultural competency above technical skills, holding people accountable to DEI measures at all levels, choosing Black-owned businesses as vendors first, clearly showing values in social media, and ensuring the decision-making body is diverse. Pamela Inbasekaran, COO of Relay Graduate School, told us they took action following extensive internal conversations with each staff member and external research with other organizations and publications. Relay used what they learned to create a Diversity Steering Committee, adopt best practices in anti-bias hiring, encourage more informal mentorship and development of strong leaders of color, and become vigilant about collecting staff racial and ethnic data then using it as a foundation for decision-making and investments. In the panel we heard how Hilary focuses on diversity, equity and inclusion every single day because “interrupting these inequities is my work.” She shared the steps she takes to continue making progress: create spaces for conversations for people to learn together and have conversations about equity, truly listen to diverse voices in your community across roles, tenure and expertise, and be willing to make financial investments and tradeoffs in service of equity. None of us consider ourselves experts. We are learning as we go but we put this session together because we find inspiration, power, strength, and restoration in sharing our steps and missteps while learning from others. In that spirit, I hope you’ll be willing to share yours, too. This post is tagged diversity, equity, inclusion, leadership, management.